This week's Friday Fashionista had effortless style, rare beauty and the best hair in the history of the planet (at least I think so!) She was a model, actress and dancer....Rita Hayworth! Margarita Carmen Cansino was born in Brooklyn on October 17, 1918. Her parents were both dancers and enrolled Rita in classes when she was very young. Due to her dancing, she got her first feature in the short film, La Fiesta when she was eight. Her father took Rita with him to Hollywood to make her a dancing star but the Great Depression killed his business. Since Rita was too young to perform in night clubs in California, he took her to Tijuana, Mexico, where they performed under the name "The Dancing Cansinos". She had a few small roles in films throughout her dancing years but when the dance act was noticed by an executive from Fox, he signed her on for a 6 month movie contract. Through small roles with Fox and Columbia Pictures, Rita was type-cast as an exotic foreigner but Columbia Pictures soon decided that she needed to change her look. She dyed her hair red, re-shaped her brows and raised her hairline. 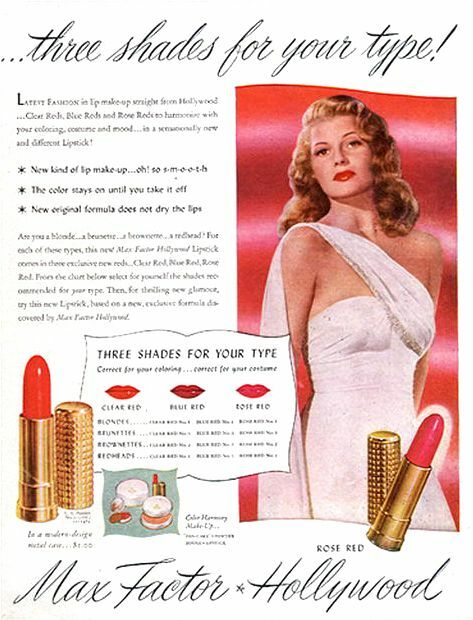 She began using the name "Hayworth" from her mother's maiden name "Haworth"
In 1941, her photo appeared in Life Magazine, making her one of the top pin up girls of World War II, second only to Betty Grable. She was one gorgeous and glamorous woman. Her hair was very beautiful too. Love Rita!!! I wish I had her looks and her hair! Always so stunning and stylish to boot! Great post!! She was beautiful, and so talented! Gosh wasn't she stunning! Mind you every time I read she raised her hairline I always wonder how?! Years of very painful electrolysis!! That's how. She needed to look American. They even made her lose weight. Which she really didn't need to do. I read a few sites that said she had electrolysis. I don't know if they had electrolysis back then but I guess it's possible. I've seen a few 40's beauty booklets that mention plastic surgery. I guess she could have waxed or something. Interesting at any rate! This girl is so perfect!! i love her to SO MUCH! Rita has always been - and will forever be - one of my leading sources of vintage Hollywood fashion inspiration. From her flawless red curls to her elegant smile, she was is perpetually muse worthy. Wishing you a gorgeous Tuesday, dear gal! What a beauty she was! I am always stunned by her bright eyes and smile! She was so beautiful and she looked glamourous in everything she wore, she is definatley one of by biggest inspirations!